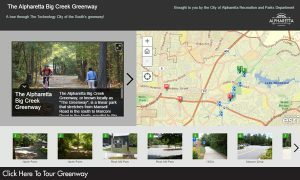 For the latest status of the Big Creek Greenway in Alpharetta please like us on Facebook. We will occasionally post updates on Facebook & Twitter when we have closings due to excessive rain or maintenance activities. Alpharetta Recreation & Parks on Facebook , Alpharetta Recreation & Parks on Twitter or just call 678-297-6123. Mile zero for the City of Alpharetta’s portion of the trail will begin at the City Limits of Alpharetta and Roswell. The mileage ends at the Marconi Trail head. Mile markers only reflect the distance on the main trail. Boardwalks, connectors and spurs are not calculated. The concrete trail is approximately 8 miles and meanders along Big Creek parallel to North Point Parkway, from Windward Parkway at Marconi Drive on the north end to Mansell Road on the south end. A soft mulch trail encircles a large wetland between Haynes Bridge Road and Mansell Road. Wildlife such as blue heron, deer, ducks and Canada geese can be observed in this preserved water setting.